Pickle making class went well today. We processed 15 lbs of cucumbers into about 15 pint jars. 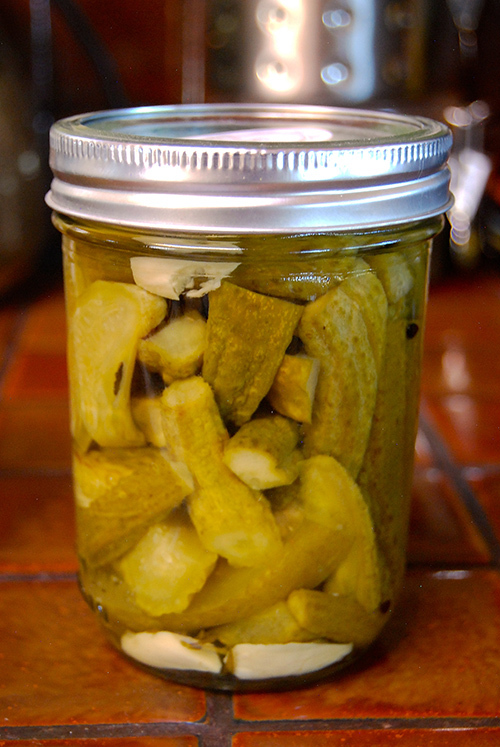 Pictured above are some of the finished pickles. Duskin, who co-taught the class with me brought his giant pressure cooker. We didn’t use it as a pressure cooker this time but instead filled the big pot with water to sterilize the jars and to use for processing the pickles using the water bath method. I brought my camp stove to make the brine and syrup. 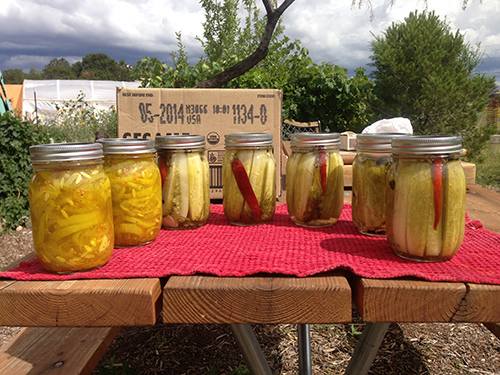 It was a beautiful day for making pickles outside instead of over a hot stove. After a short talk on the how to process food safely, everybody got involved—Duskin sterilized the jars, while the students cut up the cucumbers and garlic, mixed up the brine and syrup, added all the ingredients and cucumbers into the hot sterilized jars as they came out of the pot, poured the brine and syrup, wiped the lips of the jars and put the lids/caps on them. Then we put them back into the hot water and brought the water back to boiling and adjusted the processing time for our high altitude. While we were waiting for them to finish processing, Duskin showed them around Milagro Community Garden. When the pickles were done, we pulled them out of the hot water and let them cool enough and then the students took home a jar of each type of pickle. Good job folks! Do you have too many cucumbers? Do you want to learn how to make pickles? It is much easier than you think! 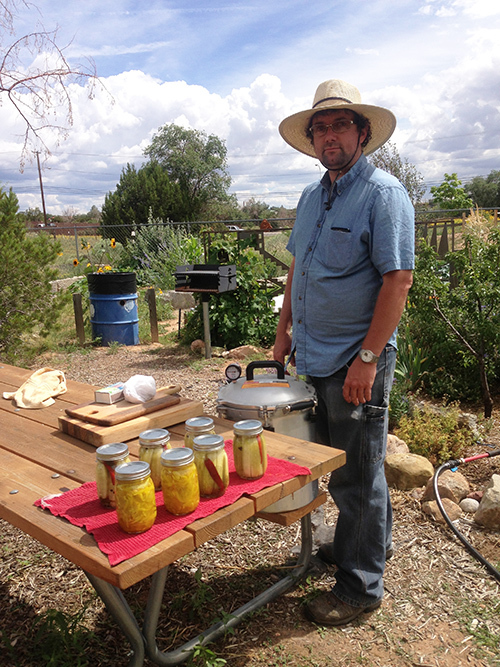 Today from 12 noon – 3 pm I will be teaching a preservation class on pickling for Home Grown New Mexico. Those who show up will learn how to make two types of pickles-bread and butter pickles and dill pickles. We will review canning safety at high altitudes and then make the pickles using the water bath method. This is a hands-on class.